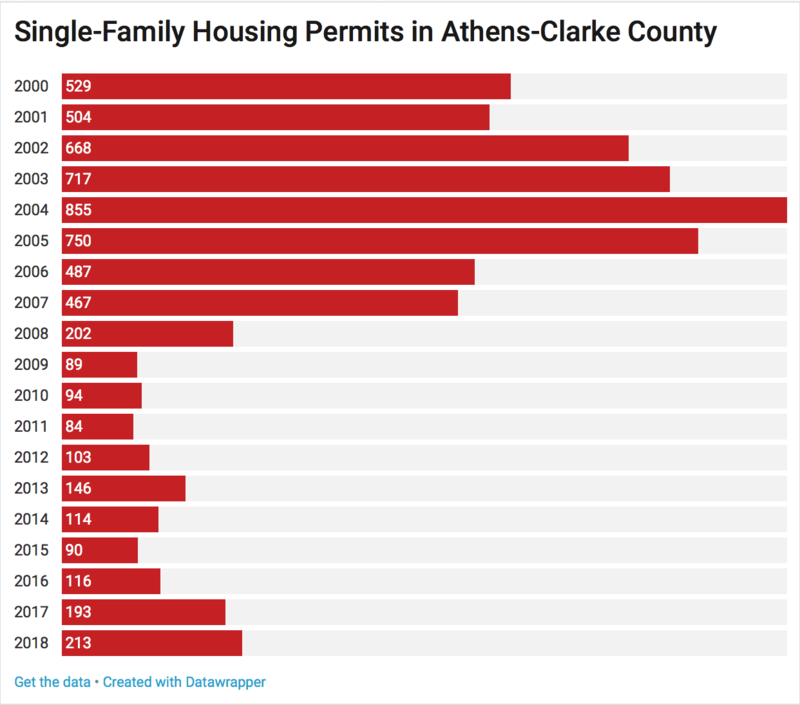 During the housing boom of the mid-2000s, Athens-Clarke County received hundreds of single-family new construction permits yearly. As the housing crisis swept the nation, these numbers dropped drastically to levels below 100. Now, over the course of the past couple of years, the county has seen an increase in these permits yet again, and as of this August, the number of single-family housing permits has surpassed levels not seen in 10 years. Why It’s Newsworthy: The Athens-Clarke County housing market is seeing an increase in new single-family construction that it hasn’t experienced in a decade. This change has the potential to affect housing prices, property taxes and the overall make-up of the county. “We’ve seen a big increase in single family construction this year,” said Doug Hansford, director of the Athens-Clarke County Building Inspection Department. Hansford, a long-time Athens resident who has worked with the Athens-Clarke County government since 1990, had a few theories regarding what has caused the increase. However, Hansford also noted that efforts by county officials could also be cause for the increase, specifically pointing to zoning ordinances. According to Hansford, changes made to the Athens-Clarke County zoning ordinances during the mid-2000s have encouraged building within the urban areas of the county rather than just focusing “outside the old city limits” in suburban areas. Aron Hall, Neighborhood Notification Initiative coordinator planner II for the county, added to this list in noting pre-recession causes for the recent increase in single-family housing permits. Regarding where these new housing permits will have the most effect, Hansford pointed to two areas of Athens that are growing most rapidly—in-town and the west side of town, specifically pointing to the Boulevard and Normaltown neighborhoods. For some residents of the county, the increase in construction hasn’t gone unnoticed. Amy Medlock, a resident of the Normaltown neighborhood, said the increase was not only noticeable, but at times worrisome. Medlock added that she feels this isn’t a fault of the new occupants, or even the new builders—but more a consideration of the local government. Those working directly with the issue seem to be cognizant of the necessity of forethought as well, as Hall noted similar concerns before also concluding that the increase is overall a positive for the community. Emma Korstanje is a senior majoring in Journalism in the Grady College of Journalism and Mass Communication at the University of Georgia.